See the Automatic Renewals information to find out about renewals and return dates. To borrow books use the self-issue machines. You will need to use your DMU ID card (white P800 card for external library members) and library PIN. Note: All items borrowed on your card are your responsibility. Please do not lend your card or any borrowed library items to anyone else. How long can I keep my loans? Normal Loans are for 2 weeks but, providing there is no reservation, will be automatically renewed (see below) for further periods, up to 99 times in all. Items on loan that are recalled by another user cannot be renewed and fines will apply if they are not returned by their due date. If the item you are borrowing has already been requested by someone else (you may see this when borrowing items on our reservation shelves, where several people have all requested the same title) it will only loan to you for 7 days, to ensure everyone gets access to the item as quickly as possible. Short loans should be returned by 1pm next day – renewal is not possible by phone or online but items may be returned and re-issued in person at the Main library counter, unless required by another user. Laptops are loaned for 3 hours with no renewals but students can borrow another one on return. Inter library loans have variable due dates as these are set by the libraries who lend them to us. No renewals are possible. Normal loan items are issued for two weeks and will auto-renew unless required by another borrower. We recommend you regularly check your Library Account for due dates. We will send a courtesy email to you if an item cannot be renewed. This will be using your DMU email, or the email address you provided when you joined us. Please therefore ensure that you check your e-mails regularly. If we need a book back and can’t renew it for you, we will tell you five days before it’s due, with a reminder on the day before it is due back. 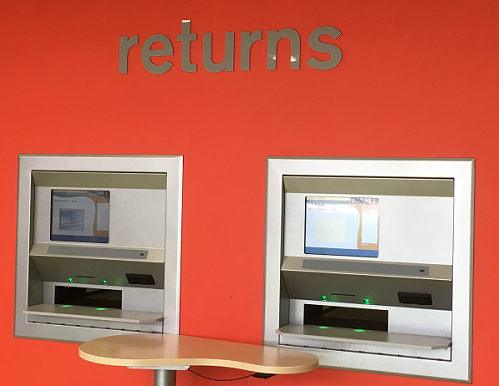 To return books to the Kimberlin Library, simply post items through the return slots in the foyer. You have the option to print a receipt listing all returned items, which we encourage you to do. If the Library is ever closed, use the return book drop outside. Normal loans can be returned to any DMU library. Short loan items must be returned to the loaning library only. Fines incurred from overdue items will normally only be waived in line with the circumstances described in our library fines exceptions policy, provided in the drop down box below. If you feel your circumstances match those within the policy, then please ask at Kimberlin Library or contact us to discuss waiving fines. If you misplace or lose an item you will be asked to pay for it at the current replacement cost plus a sum to cover administration. Fines incurred from overdue items will normally only be waived in line with the circumstances described below. All items are subject to recall when reserved by another borrower, and due dates will automatically be amended to reflect this. If you feel your circumstances match those within the policy, then please ask at Kimberlin Library or contact us to discuss waiving fines. Notes/evidence required: A medical certificate or confirmation from your department of your medical absence or an email from your faculty disability co-ordinator. All evidence must confirm your dates of absence. Fines will only be waived for those periods covered by the evidence. Notes/evidence required: Evidence that you have been away from campus e.g. email from tutor. All evidence must confirm your dates of absence. Fines will only be waived for those periods covered by the evidence. Notes/evidence required: All items should be renewed online using the Library Catalogue. Fines will only be waived for books recalled due to a reservation by another borrower where DMU has been closed due to the weather. Transport difficulties will not result in fines being waived. Notes/evidence required: Staff member will check your borrower record, and waive the fine if no prior instance of incorrectly returning laptop has occurred. Further instructions on how to successfully return a laptop will be provided. Notes: Borrowers are encouraged at all times to check emails and library account regularly. Notes: Borrowers are expected to make arrangements to return items prior to going away on any planned absences from University. Notes: Borrowers are expected to prepare beforehand and we advise that De Montfort University items should not be taken out of the UK. Furthermore all items are subject to recall when reserved by another borrower throughout the year and will accrue fines if not returned. Notes: We issue items normally throughout the whole calendar year because of the number of students who live locally, and due to the university offering postgraduate programmes and other programmes that don’t follow the undergraduate teaching calendar. All items are therefore subject to recall when reserved by another borrower throughout the year and will accrue fines if not returned. Notes: Borrowers are expected to make arrangements to return items prior to going away on holiday. Notes: Borrowers are expected to make alternative arrangements to access email. Notes: Borrowers are advised to claim compensation for the charges incurred via their insurance policy and to notify the library at the time of the theft. Notes: The email reminders are a courtesy and non-receipt of them will not result in fines being waived as you can view item due dates through My Account on the Library Catalogue and on the receipt given on loaned items. Notes: Borrowers should not loan their ID card or library items to others and are liable for all fines and/or replacement charges incurred if they do so. Notes: There are labels on the laptops reminding borrowers that they must re-attach the charging cable in order to discharge the laptop from their account. As a goodwill gesture the first occasion this occurs will result in a fine being waived. Any future occasions will generate a fine.